The start of the rainy season adds logistical hurdles to the humanitarian response and increases fears of disease outbreaks. 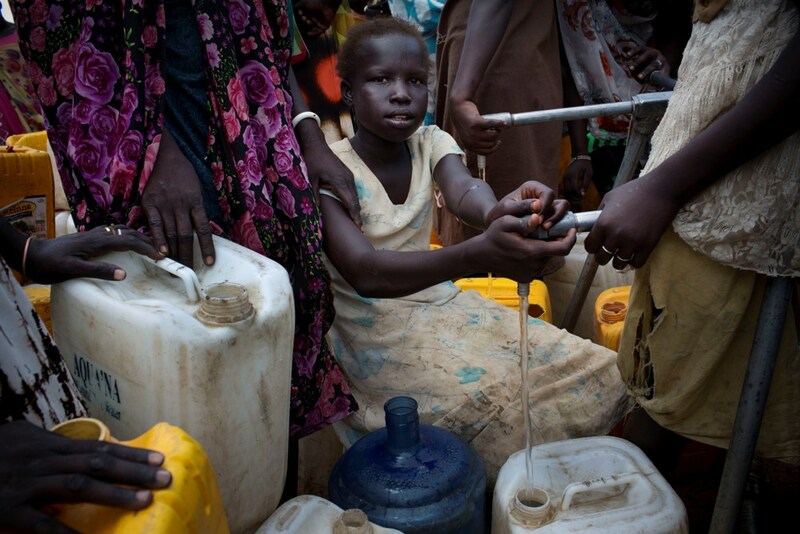 On March 23, a girl fills a jerrycan at a water point run by UNICEF at a displacement site on the Tomping base of the United Nations peacekeeping mission in South Sudan, in Juba, the capital. Around her, women and other children displaced by recent violence fight their way to the water point. Click image to enlarge. A government power struggle charged by ethnic undertones is roiling the young country of South Sudan and creating a health and safety crisis for the roughly 1.3 million people uprooted in four months of brutal violence. According to United Nations and American aid officials, clean water is scarce in many refugee camps, and there are too few latrines. With many farmers cut off from their fields, food production is expected to drop. The UN warns that famine is possible. Meanwhile, the onset of the five-month rainy season brings threats of malaria and cholera outbreaks in packed camps, along with concerns about flooding in low-lying areas. Delivering aid by truck will be difficult once the rains arrive, and expensive airlifts will be necessary. The size of Texas, South Sudan has just 363 kilometers (225 miles) of paved road in a country of 10.8 million people. Water and sanitation are two of the biggest challenges facing aid groups, said Jeremy Konyndyk, director of the U.S. Agency for International Development’s Office of Foreign Disaster Assistance. Konyndyk told Circle of Blue that he visited South Sudan last week. His office is helping move refugee camps in flood-prone areas to higher ground and to build latrines that will not collapse in saturated soils. As the warring factions meet this week for peace talks in Ethiopia, nearly one million people are displaced within South Sudan, while some 300,000 have fled to neighboring countries, according to the UN, which is threatening sanctions against the political leaders. As many as 4.9 million people – almost half the population – need emergency health care, food aid, or protection. Estimates of the number killed in the civil war are in the range of 10,000. Ethnic violence, border disputes, and political in-fighting have marked the three years since South Sudan, a poor country that that relies on oil revenues for more than 90 percent of its budget, gained independence from Sudan. 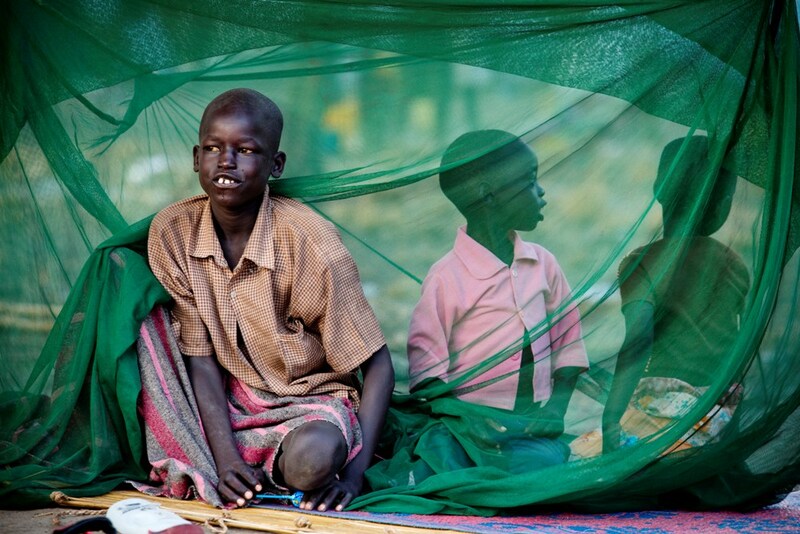 On 25 March, children displaced by recent fighting sit amid mosquito netting, in the town of Mingkaman, where food assistance is being provided, along with cholera vaccinations. Click image to enlarge. The fighting today, centered in the northeastern states of Jonglei, Unity, and Upper Nile, began in December between factions loyal to President Salva Kiir and rebels sympathetic to Riek Machar, a former vice president sacked by Kiir last July. Though the political machinations reflect internal divisions still festering from the country’s war for independence, ethnic divisions have compounded the problems, argues the International Crisis Group, a policy think tank. Kiir is a Dinka, the largest tribe, and Machar is a Nuer, the second largest. These differences can mean life or death for those in the cross hairs. Aid groups report that civilians are being killed because of their political loyalty or their ethnicity. Even a UN compound in Jonglei state was targeted. Doctors Without Borders, an international health charity working in South Sudan, interviewed those who witnessed an April 15 attack on a hospital in Bentiu, capital of Unity state. One witness described opposition fighters searching for defectors who sought shelter in the hospital. As many as 33 people were killed, Doctors Without Borders claims. The rapid escalation of violence in a country with little supporting infrastructure created chaos not only on the streets. Refugee camps, too, are places of squalor and disorder. After the hospital killings, more than 16,000 people fled to the UN peacekeeping base in Bentiu for safety. The base could not accommodate so quickly a tripling of its population. Refugees had access to one liter of clean water per day, and an average of 350 people shared each latrine. Among many needs, adequate toilet facilities stand out. Konyndyk, the USAID official, said temporary latrines built to dry season standards collapsed as the rains soaked the soil. His teams are building stronger, larger structures by using buried shipping containers. “They will not collapse, they can be easily emptied, and they will not seep into the ground,” Konyndyk said. Though fighting is concentrated in three states, the entire national economy is affected. Through March, oil production was down 29 percent and was halted altogether in Unity state. Agriculture also is unsettled, said Konyndyk. Meanwhile, the search for a political resolution resumed this week. The South Sudanese government and rebel leaders reopened peace talks Monday in Addis Ababa, the Ethiopian capital.